Dining to Donate at Arizona Pizza! 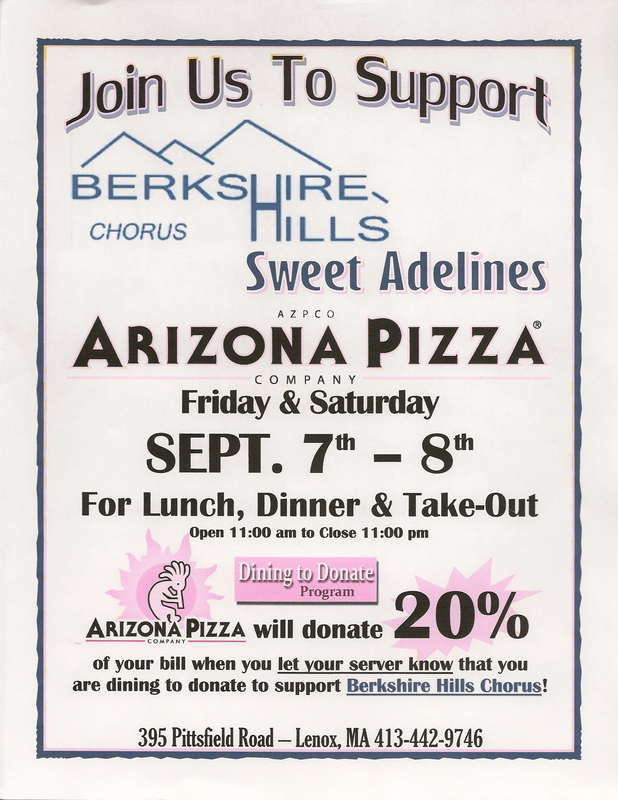 If you are out and about on Sept 7th and 8th, stop by for lunch or dinner at Arizona Pizza Company in Lenox and help out the Berkshire Hills Chorus by Dining to Donate. Just mention that you are there to support the Berkshire Hills Chorus, and 20% of your check will be donated to help keep our chorus running. This offer is valid on all dine-in and take out orders at the Arizona Pizza location at 395 Pittsfield Road in Lenox on Friday, September 7th and Saturday September 8th from 11:00am to 11:00pm. Tell your friends! We hope to see you there!